"We asked LTC Tree Surgery to take our tree down while we were away. When we returned it was gone! No trace at of it all. Those boys did such a wonderful job"
Here’s a selection of customer reviews on our tree surgeon services from our Facebook page. Our professional, experienced and certified tree surgeons are called out across Bolton, Chorley, Wigan and Preston, but we get plenty of custom too from homeowners wishing to have their garden cleared, trees felled and trees pruned in Southport (Merseyside), Wilmslow, Chester, Northwich and Knutsford areas of Cheshire, and Stockport, Rochdale and Bury areas of Greater Manchester. 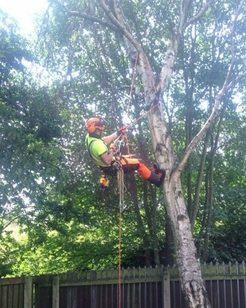 If you live within Greater Manchester or near any of the above locations and require any of our tree care or garden services, give us a call for a quotation.